Do you remember that beautiful porchetta on a stick in the fire pit? You think this dish is one of a kind? If your answer “yes” then you’re wrong! Let’s make a wrapped whole chicken version withsavory prosciutto and fresh dill, everything is flavored with lavender and special chicken spice blend. 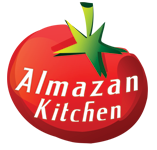 Stay tuned to AlmazanKitchen and you will never run out of camping recipes! Add 1tsp. of lavender, salt to taste and 1tsp. of special chicken spice blend spread evenly. Wrap everything around stick and secure with rope. Roast for 2-3 hours constantly rotating.